The history of mosaic goes back some 4,000 years or more, with the use of terracotta cones pushed point-first into a background to give decoration. By the eighth century BC, there were pebble pavements, using different colored stones to create patterns, although these tended to be unstructured decoration. It was the Greeks, in the fourth century BC, who raised the pebble technique to an art form, with precise geometric patterns and detailed scenes of people and animals. By 200 BC, specially manufactured pieces ("tesserae") were being used to give extra detail and range of color to the work. Using small tesserae, sometimes only a few millimetres in size, meant that mosaics could imitate paintings. Many of the mosaics preserved at, for example, Pompeii were the work of Greek artists. 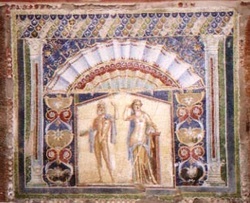 The mosaic here shows the god Neptune with Amphitrite (on the right) and is in Herculaneum, Italy. It is a wall mosaic which uses pieces of glass to give the vivid colors and reflect light. Glass was not suitable for floor mosaics. Here, the tesserae were mainly small cubes of marble or other stone. Sometimes bits of pottery, such as terracotta, or brick were used to provide a range of colors. The expansion of the Roman Empire took mosaics further afield, although the level of skill and artistry was diluted. 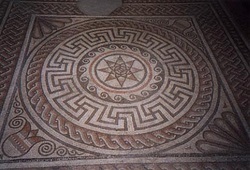 If you compare mosaics from Roman Britain with Italian ones you will notice that the British examples are simpler in design and less accomplished in technique. Typically Roman subjects were scenes celebrating their gods, domestic themes and geometric designs. The inter-twined rope border effect here is called "guilloche". With the rise of the Byzantine Empire from the 5th century onwards, centered on Byzantium (now Istanbul, Turkey), the art form took on new characteristics. These included Eastern influences in style and the use of special glass tesserae called smalti, manufactured in northern Italy. These were made from thick sheets of colored glass. Smalti have a rough surface and contain tiny air bubbles. They are sometimes backed with reflective silver or gold leaf. The mosaic below is from the ceiling of the baptistery in Florence, Italy. Other spectacular examples can be found in Ravenna, Venice and Sicily and in Istanbul. Whereas Roman mosaics were mostly used as floors, the Byzantines specialized in covering walls and ceilings. The smalti were ungrouted, allowing light to reflect and refract within the glass. Also, they were set at slight angles to the wall, so that they caught the light in different ways. The gold tesserae sparkle as the viewer moves around within the building. 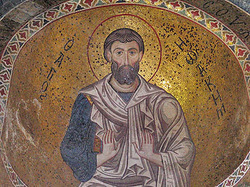 Roman images were absorbed into the typical Christian themes of the Byzantine mosaics, although some work is decorative and some incorporates portraits of Emperors and Empresses.